Director Sergio Corbucci delivers the kind of European western that inclines one to say they're a fan of the genre when they're really not. All of the essential ingredients are here, yet none of them overstay their welcome. The attention to characterization, Ennio Morricone's soundtrack featuring sitars, no less, the beautiful atmosphere that doesn't threaten to drown the movie in style, and the original revenge plot make for an impressive flick. 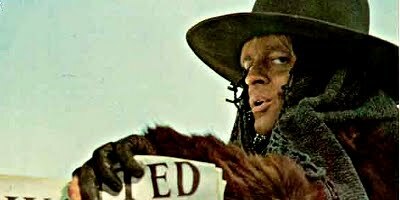 Jean-Louis Tritgnant's justified maiming of his enemies by blowing off their thumbs, thus rendering them useless gunfighters, is not only cool but furthers Corbucci's somewhat disturbing cinematic motif of demolishing peoples' hands onscreen. Unsurprisingly, Klaus Kinski plays the kind of villainous part he could do in his sleep, yet enjoys a supreme moment, pantomiming the making of a doo-doo only to brandish a rifle hidden in a snowdrift. Frank Wolff gives a realistic performance as a bumbling sheriff without the any macho posturing or super-heroics, and Luigi Pistilli plays an uncommonly evil Jewish merchant. Tritgnant sports the nifty repeating handgun with optional stock, something more likely to be found in Lee van Cleef's arsenal. Movie also features the death of a slurping, chicken-inhaling bounty hunter whose appalling table manners justify his execution. Overall, a decent "blizzard" western that can stand alongside other notable international offerings as Night Without Law, Cutthroats 9 and McCabe & Mrs. Miller.